Here is a raw version of breakfast cereal I picked up at my class. Emmett and I love it. The rest of the family are not huge friends. Brent and Callista will eat it but ask for the mulitgrain hot cereal. 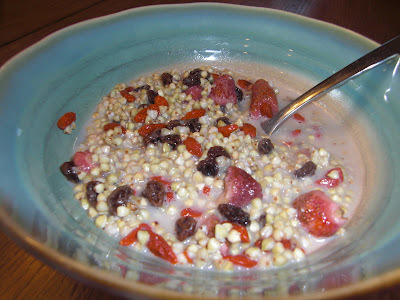 Soak 2 cups hulled, organic buckwheat and 1/4 cup dried goji berries overnight. You may want to rinse a few times. In the morning some fruit and sweetener of your choice. We like raisins, strawberries and pure maple syrup. Top with almond milk. I have to confess...I do warm it up a bit. It just tastes so much better.